I wrote recently about the mis-wired HP plotter cable that help me gain major insights into marketing. But I just remembered another funny story. HP’s first ink-jet printer was called the ThinkJet. It was radical for its day; really small, just a little larger than about 2 full-size books stacked together. Alas, my prototype didn’t work that well, but it sure was the harbinger of things to come. The prototype I was testing was housed in a wooden box! But after the clunking printers I was used to, the ThinkJet was great. I remember dragging people into my office to listen to how quiet it was (that’s an odd way of saying that you could barely hear it). The printer is described here on the HP Virtual Museum site. Wow, check out the specs: they claim 150 characters per second (I don’t remember it being that fast, but who knows?). And the resolution was a whopping 96 x 96 dots per inch – about what you now get on a monitor. Oh, and the ink clogged the nozzles with alarming frequency. But it sure beat the first laser printer I used. 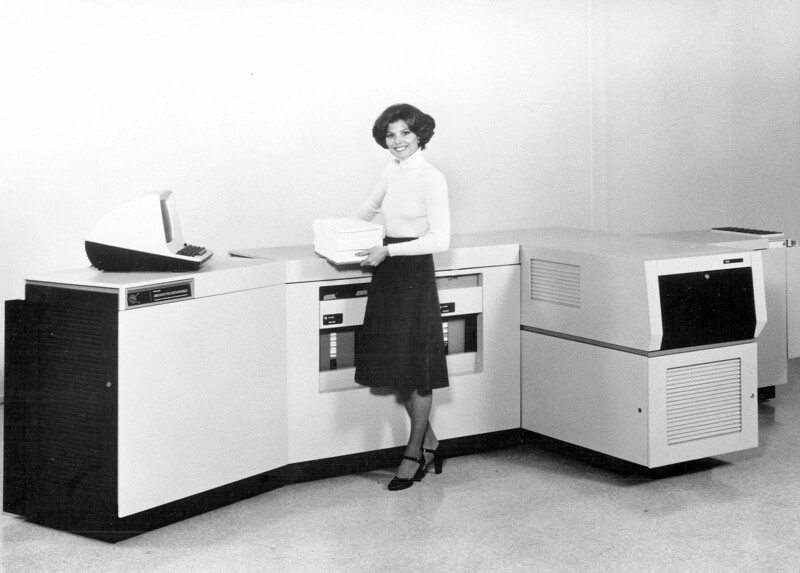 That was a giant Xerox 9700, which was almost as big as a car – but considerably more expensive! Picture is from the Digibarn site.